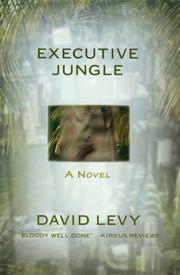 Levy’s fifth (Potomac Jungle, not reviewed) takes on Madison Avenue and the advertising game much as its template—Frederick Wakeman’s The Hucksters—did 50 years ago. In this thoroughly detailed business novel (much stronger than Wakeman’s light but sparky effort), with its old-timey pace, nobody worries about integrity—all are too busy keeping their heads out of the shark’s mouth—or the lion’s maw. The ten segments here are linked by the career of bright and aggressive Steve Lane, who moves from a Philadelphia ad agency to Madison Avenue’s Otis & Meade at nearly twice his former pay. O&M, it turns out, is in the throes of a top-level turnover: Meade’s no longer there, and Otis is 64, apparently ready to retire, dump his wife, and go off with his 40-year-old secretary to a peaceful old age. Under Otis are the company’s three top managers, one of whom must be his replacement. These three have formed a cabal to oust Otis through a stockholders’ vote and take over the company themselves, but Otis beats them to the punch, appointing one of the trio’s younger execs to his presidency while he becomes chairman. The second of the three’something of a hothead—then quits, and Otis has the president-to-be fire the third, after which he cans the new president (albeit with a velvet glove). At the other end of the frame, over 15 years later in “Five O’Clock Deadline,” Steve Lane (now top exec) is fighting for his life against a takeover by television personality Curly Ames, whom Steve himself brought into the fold from an Atlanta radio station and whose unpredictable personality has baited him to the number one ratings slot—and turned him into a rapacious shark. Levy, a vastly accomplished entertainment executive who started with the Young & Rubicam ad agency in 1938 and also wrote many famous radio shows, knows whereof he writes and how some stabs can never be stanched. Bloody well done.